What would happen if the Australian national electricity grid collapsed or a war broke out in the Asia-Pacific, blocking cargo ships carrying liquid fuel from reaching us? Australians people and businesses rely on electricity, water & liquid fuels. Supply interruptions are relatively rare, often due to storms or bushfires. These outages are usually brief and Police ensure order is maintained. 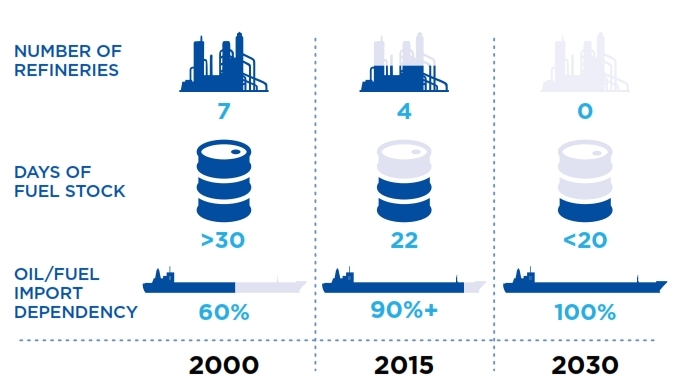 A new NRMA commissioned report about Australia’s Liquid Fuel Security reveals that we face the real risk of not having any domestic oil refineries by 2030, which would leave us wholly dependent on foreign liquid fuel supplies. “Our liquid fuel supplies could be severely constrained. We do not have a viable contingency plan in place for this event. If this happens then Australians will suffer food shortages, will not have adequate access to medical services or pharmaceutical supplies, will not be able to get to work and, if the problem lasts for more than a few weeks, many will no longer have work to go to. It is that serious”. Similarly developed countries like Australia have only limited experience with major blackouts of the electricity grid. In the developing world, these are more common so people tend to have far better backups (kerosene lamps etc) as well as far lower expectations of reliability. Examples from our region include tens of millions of Indonesians blacked out in 2002 and 2005 as well as the massive 2012 power outage which affected over 600 million Indians. Ironically our reliance on computerised systems and complex just-in-time freight logistics supply chains makes developed countries like Australia more fragile and vulnerable to energy outages than poorer countries. Iain MacGill from the Centre for Energy and Environmental Markets at UNSW told SBS that overseas experience suggests the occurrence of widespread blackouts here is a real possibility. “Almost all public services rely on the electricity grid so you can expect widespread failures. Power system operators may be able to keep supply to some key loads whilst blacking out other customers, and these loads will generally include critical public services”. “For more severe and widespread blackouts, you can expect traffic lights and electrified public transport to fail early on so traffic chaos ensues. Petrol stations rely on electric pumps and often won’t have backup generation”. “Recovery may take some time, particularly if the blackout is just part of a wider natural disaster, and generally occurs in stages where the most critical loads are bought back on-line first”. “There is a growing appreciation in the worldwide electricity industry that climate change is already posing new challenges for power system security [such as] more extreme weather events and bushfires. Managing these growing risks will cost us money and effort – yet another ‘carbon price’ associated with failing to address climate change here and internationally”. Large power outages which occurred in New York during 1965, 1977 and 2003 demonstrate what can happen to a city when electricity isn’t available for up to a day. Reactions by New Yorkers ranged from helping each other to violence and arson. How would Australians react to extended fuel or electricity outages? Let’s hope the Federal Government plans ahead so we never have to find out. Funny this is from 2 years ago as this has come up in discussions again due to the over-reliance on “green” energy. *correction, almost three years ago.